It seems like recently homeowners have finally begun to realize that they can use the space outside of their home just like they use the space inside of their home. Personally, I absolutely love the outdoors. However, it can sometimes be difficult to get outside for longer than ten minutes if there’s no design in place. Designing your outdoor space so that it acts as an extension of your home will not only make it more comfortable, it will help draw people outside. One of the most important facets of designing outdoor spaces is making sure that the space is used appropriately. This means that if you only have a small deck to work with, don’t try to introduce too much in the way of furniture. Those of you with larger outdoor spaces can introduce more elements. Organizing your seating around a water feature or a fire pit can help add charm to the area. 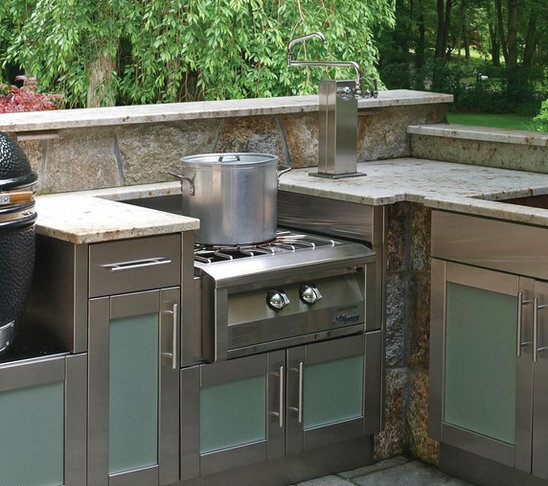 Many homeowners are even introducing kitchen elements, such as outdoor countertops and refrigerators to complement their grill. I love the new colors that are being offered by Jordan Brown Outdoor Kitchens who recently announced a licensing partnership with Danver Outdoor Kitchens. Danver was showing us the vibrant range of colors available at KBIS this last weekend in New Orleans. Some of the Brown Jordan colors available at KBIS 2013. Just be sure not to add these elements to your outdoor space haphazardly. You should plan the space just like you plan your interior design. To find out more about designing outdoor spaces as well as all other aspects of interior design for your New Orleans home, please contact me online at Susan Currie Design.